The Big Wobble: Mount Agung, which hasn't seen an eruption in more than half a century spews ash and smoke 700m into the Bali sky! Mount Agung, which hasn't seen an eruption in more than half a century spews ash and smoke 700m into the Bali sky! 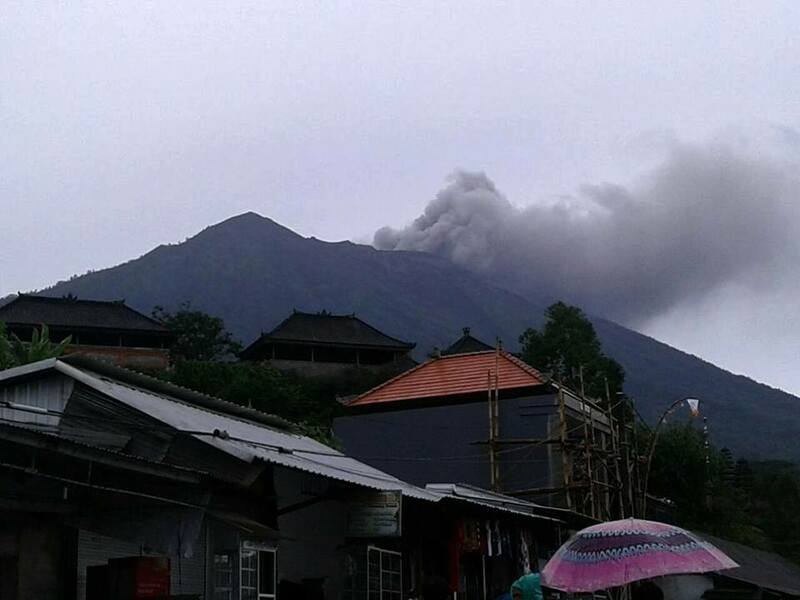 Dark, black smoke began billowing 700m above Mount Agung in Bali last night around 5pm local time, signalling that the volcano that has been on high alert since September had finally erupted. For the past two months, citizens residing within the danger zone of the volcano - approximately 6-7.5km within the tallest mountain peak in Indonesia's radius - have been put on high alert, with officials initially ordering more than 150,000 from their homes. After months of these warnings from the country's national disaster agency, Mount Agung, which hasn't seen an eruption in more than half a century, finally gave way to what officials are calling a 'small eruption'. In a statement to the ABC, the head of volcano monitoring at Mount Agung, I Dewa Made Mertayasa, said that the kind of eruption witnessed at the volcano is what would be classified as a 'phreatic explosion' and that there was no need for people outside of the immediate danger zone to start evacuating. "Phreatic means that the water in the crater surface collected because of heavy rain recently combined with ascending magma," said Mertasaya. The nation's alert level was first raised in late September to the maximum threat level of four, after which thousands of people left their homes to live in emergency centres. It was later dropped to level three, which it remains to be resting at, even after last night's small eruption. Though this initial eruption at Mount Agung is one that consists of only steam, officials are continuing to monitor the situation closely on the off chance that the magma brimming beneath the mountaintop decides to surface. National Disaster Mitigation Agency spokesman Sutopo Purwo Nugroho said after the volcano's eruption in a statement to ABC News that they will continue to monitor the volcano's seismic tremors, but that there hadn't been an increase in activity since the spewing at Mount Agung began on Tuesday evening. If there were to be an increase in seismic activity, he added, it would indicate that there was magma rising in the mountain and the potential for another eruption would increase. Part of the reason for this added caution being exercised by both government officials and people living close to the Balinese mountain is that they wouldn't want to see happen again what occurred the last time Mount Agung erupted. In 1963, 1,600 people died from the volcano's eruption, with many dying from being burned alive by fast-moving waves of super heated gas that plumed over the mountain's side, called 'pyroclastic flows'. As a measure of caution, there are about 30,000 people from the original evacuation order issued back in September that remain in emergency centres. #GoTeamEarth into the #Stars before we are all taken back to the #StoneAge What would it take to make all countries drop their weapons of war and work together to get #Mankind onto another world? The Earth is a Footstool!